Flats aren't all that common in today's driving experience. Neither are inner tubes. I believe there to be a direct correlation. 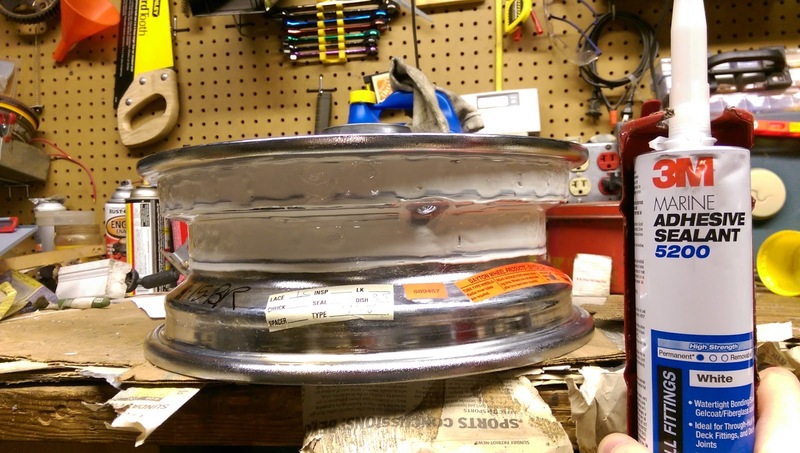 The Daytona wire wheels on my Sunbeam Alpine left me with two flats during our journey to and from the United this past year. Combine the general inconvenience of a flat with the grim prospect of finding a replacement tube (plus a shop that is willing to even consider working on a wire wheels), and you have a formula for disaster. Because tubeless tires have a patterned rough surface rather than a smooth surface, I was finding that the inner tubes were subject to abrasions from the insides of the tires themselves. The failure points were always on the outside diameter of the tube. If only there was a way to go tubeless! In consulting some other British car club forums, I discovered that there was success in sealing the rims. Armed with the confidence that this technique worked for Barney Gaylord, I set out to apply the concept to my Sunbeam Alpine's wire wheels. I decided to make the attempt using what others had found success with. This involved careful cleaning and a coating with some sealant. 3M makes a product for Marine applications called 5200. It takes a week to cure and is naturally water and air tight with good flexibility. 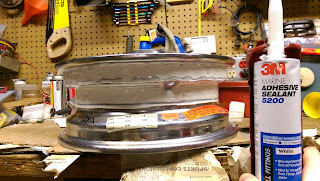 Since these rims are chromed it was easy to remove the rim strap tape and remove any residue with parts cleaner. The final wipe-down was done with brake cleaner. The Marine sealant applies with a normal caulking gun. The trick is to get it on evenly without waste or bumps. I made a special spatula tool from a piece of plastic, notched to produce a uniform application depth. Left for a day or so to cure, I then applied a layer of 1 inch wide 3M "helicopter" polyurethane protective tape. This flattened the layer of sealant and also protected its surface against the pressure of the tire bead. 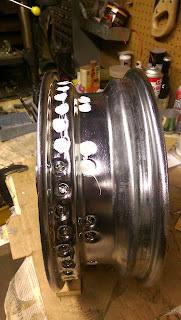 The layer doesn't have to be thick, just enough to keep it all in place and fill the spoke nut holes. Then it was left to sit for the rest of the week in a warm environment. The squeezed-out excess was easily trimmed away with a razor knife once everything had cured. To keep the outer edge of the rim with its newly sealed surface and tape protected, I decided to install the tires from the rear side. This was accomplished easily with my No-Mar Tire Changer. Getting the beads to hold air initially was another matter. I had to put the tire on an elevated platform supported by the outermost diameter of the tire and stand on the center of the wheel. Since I'm a bit of a lightweight, I also took advantage of pushing myself down on the tire by trying to lift the house by the garage ceiling rafters. ;-) The tire lube I use is so slippery the beads wanted to pop out on one side and go in on the other. After a few expletives and further physical exertion the tire beads were up against their sealing surfaces of the rim and could hold air. Two days later they're still holding air. So I'd call this experiment a success. Considering that Barney said he autocrosses with his sealed in this manner I probably don't have anything to worry about. Look out Georgia, here we come! I'll carry a few inner tubes just in case... someone else needs one.